Some time ago when people wanted to know if your friend or loved one was around, you would have to visit them in person. Today we would usually call, text, e-mail, or instant message them. What if you could just look at a common household item and instantly know? Especially in a care giver-elder relationship, having peace of mind in knowing that your loved one is up and about as usual can be very valuable. The Ambient Clock is similar to the Ambient Plant, but with a different approach. Both the Ambient Plant and the Ambient Clock attempt to unobtrusively display when a pair of users are near the household object. When asking elders from a local retirement community what they thought about the Ambient Plant, we were often given the suggestion that it would be nice to see not just real-time presence, but an overall view of presence over the day. Two clocks are connected and share the times that each clock detected movement and presence. Each clock has a motion sensor, a distance sensor, and 12 small lights underneath each hour. Each time someone sits near or walks by the clock, the paired clock pulsates gently for the duration of the detected presence. 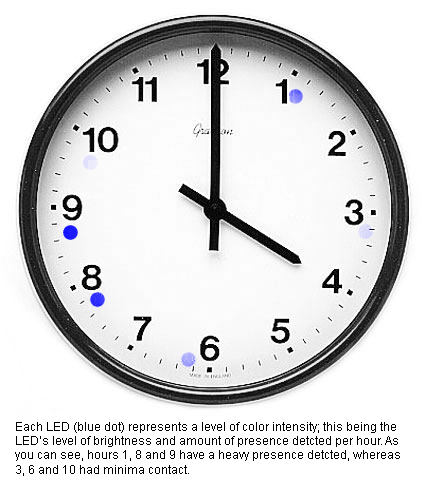 When this presence is detected, the light under the hour the presence was recorded during on the pair clock glows brighter. Each additional time during the hour that presence is detected this light glows brighter. In the example to the left, one can see the times their family member was present during the morning. The clock form factor gives a good overview as to what times the other side was present, while still being an object that is familiar in a household. Online phenomena such as Twitter and Facebook have shown that people have a strong desire to connect to their friends and loved ones and know what they are doing. The Ambient Clock aims to help users satisfy this desire in the home while remaining a common household object. Below is a video that shows how the Ambient Clock works, while showing a situation in which the clock might be used by an elder and his loved ones.